This workshop is meant to explore the dimensions of meditation- from body, to breathing, to mind. At the level of the physical self, it will help you find a quiet stillness. At the level of the breath, it will lead to an uncoupling from the tensions and negativity of daily life. At the level of mind, it will help you to learn to rest in a quiet center of being. Beginners and seasoned students welcome. Feel free to repeat as often as you like as practice makes perfect. 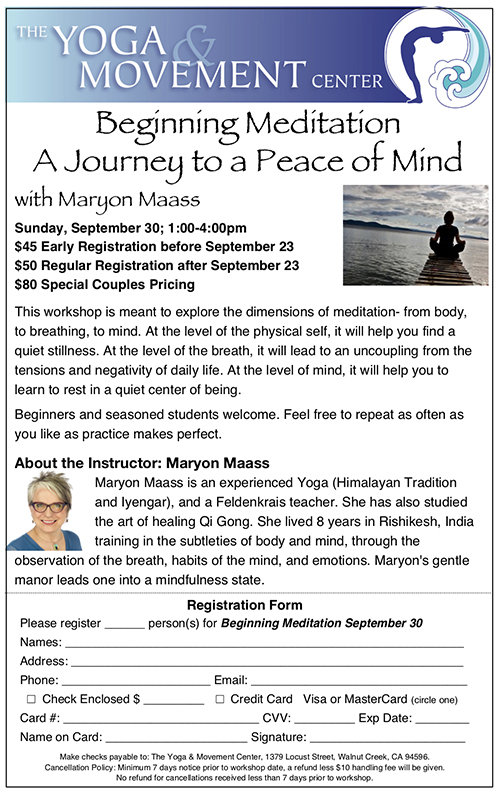 Maryon Maass is an experienced Yoga (Himalayan Tradition and Iyengar), and a Feldenkrais teacher. She has also studied the art of healing Qi Gong. She lived 8 years in Rishikesh, India training in the subtleties of body and mind, through the observation of the breath, habits of the mind, and emotions. Maryon’s gentle manor leads one into a mindfulness state. Dates and times coming soon. A series in deep relaxation and self healing. Find your deep rest, creativity, and more…take a break from the race… stop and reset your natural rhythm. A restorative yoga sequence typically involves only five or six poses, supported by props that allow you to completely relax and rest. Held for 5 minutes or more. Mindfulness, can help you live your life more fully present in the moment, heighten your spiritual awareness, and well-being, and simply help you feel more relaxed and positive. Shavasana decreases heart rate, blood pressure, muscle tension, and general levels of anxiety. It increases energy levels, boosts memory, and stimulates the ability to concentrate. It gives you a more easy sleep and brings a general sense of well-being. Combining relaxation techniques with the unique practice of “Exercise Without Movement,” yoga nidra helps us travel deeply within. The goal is greater inner awareness of the body, our states of consciousness, and how the mind manages the body. Maryon Maass ERYT-500, Lived in India for 8 years and is an experienced Meditation from Swami Veda Bharati, (Himalayan Tradition and BKS Iyengar), Feldenkrais and Qi Gong teacher. She studies the subtleties of body and mind, through the observation of the body, and breath. She leads us through subtle energies for relaxation and peace of mind for rejuvenation and longevity. For interest in visiting Rishikesh and staying a traditional ashram, please feel free to contact Maryon Maass through the contact page for more information.